Some things do a good job flying under the radar, like Primestrong here. 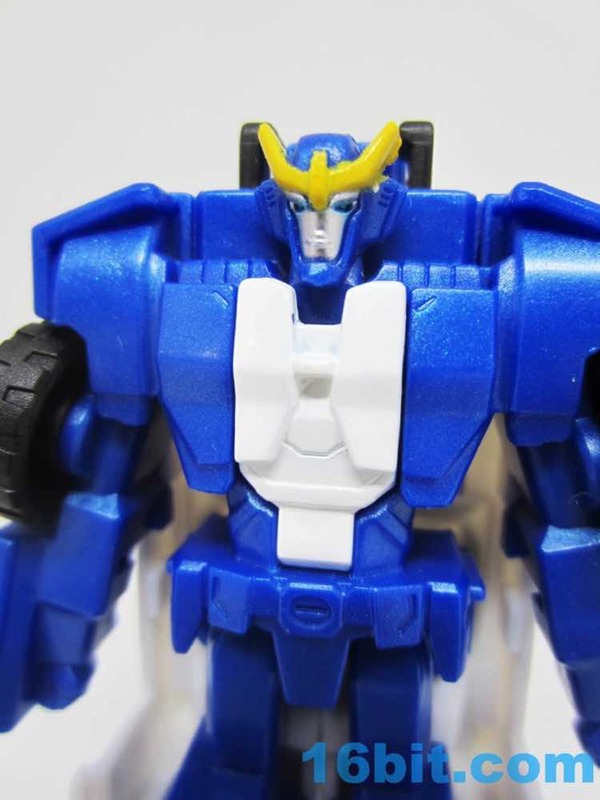 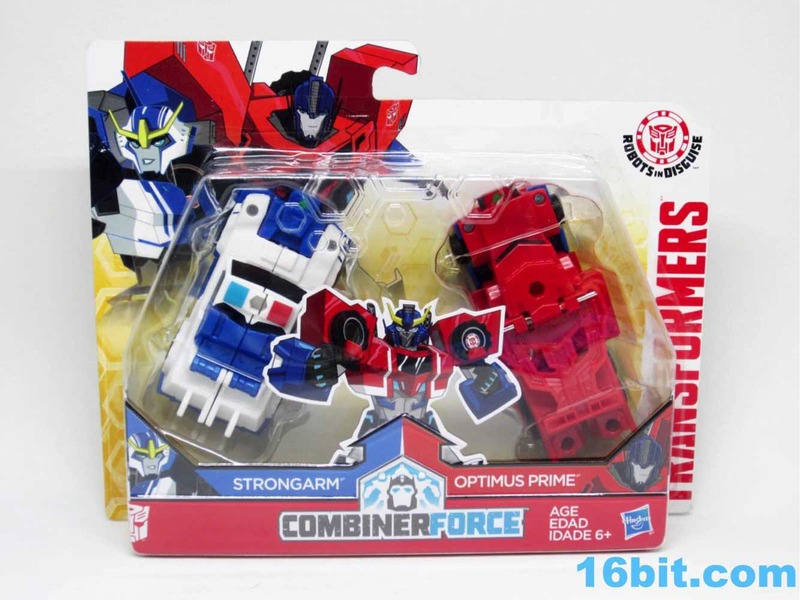 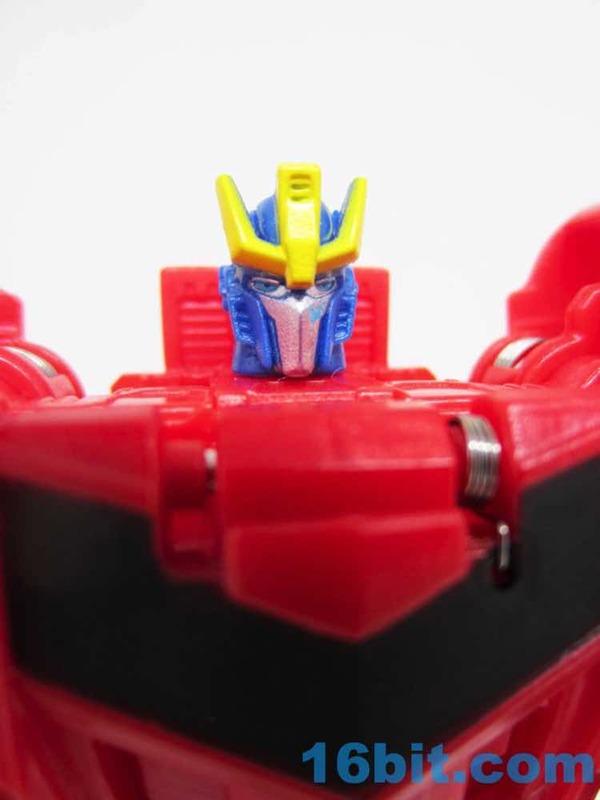 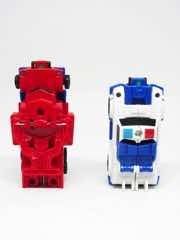 This mini Combiner brings back the auto-transformation combination we've seen in Power Core Combiners and dumbs it down a bit for a sturdier, simpler, and cheaper result. 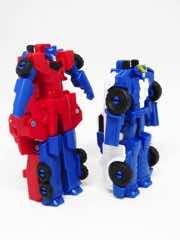 The combined robot is about 6-inches tall - roughly the size of a Marvel Legends figure or a smidgen taller than a Deluxe or Warrior Transformers toy - with minimal articulation and fidgeting. 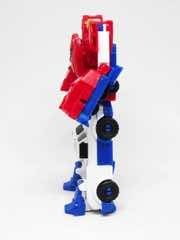 It's a simple combiner for kids, and in that respect it works well. 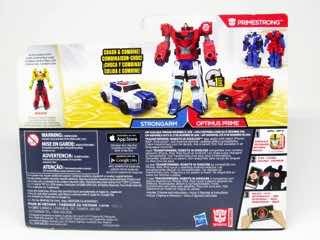 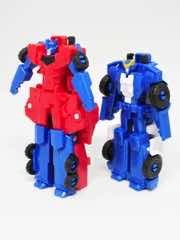 Arguably one of few positive things to come from a car accident, Primestrong is born when Strongarm and Optimus Prime smash in to one another in vehicle mode. 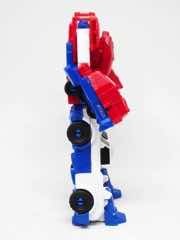 All you have to do is fold down the legs for the combined mode, and you're pretty much done in seconds. 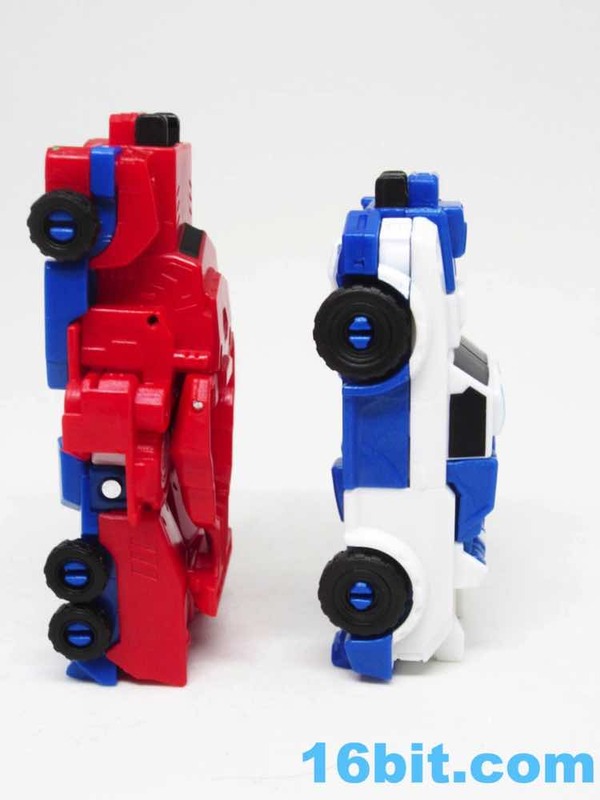 It's a heck of a clever gimmick and is one that should be good for smaller kids or TV commercials. 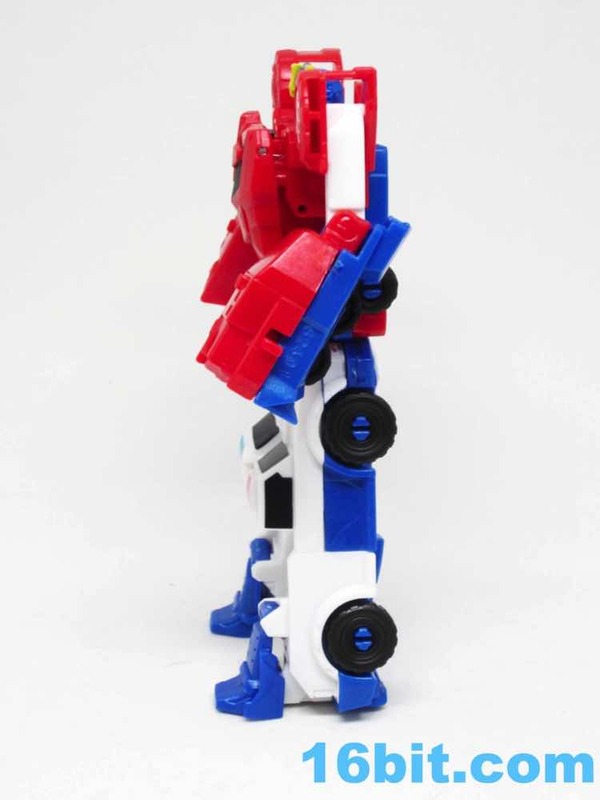 The combined robot has minimal articulation, as the legs can swing in and out a bit while the arms have shoulder and elbow joints. 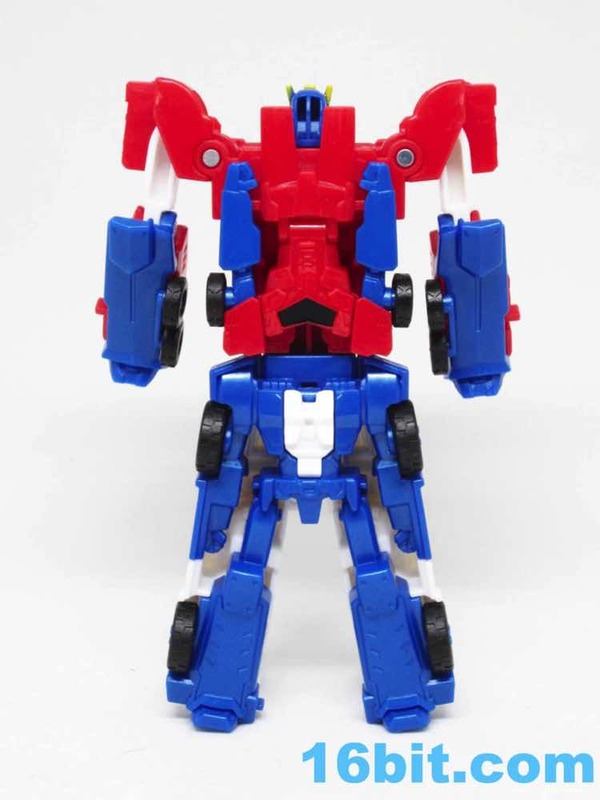 It's quite good in that capacity, so as a fun toy for kids, this is the kind of thing that should delight anyone who likes snappy transformations. 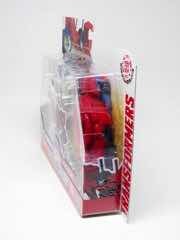 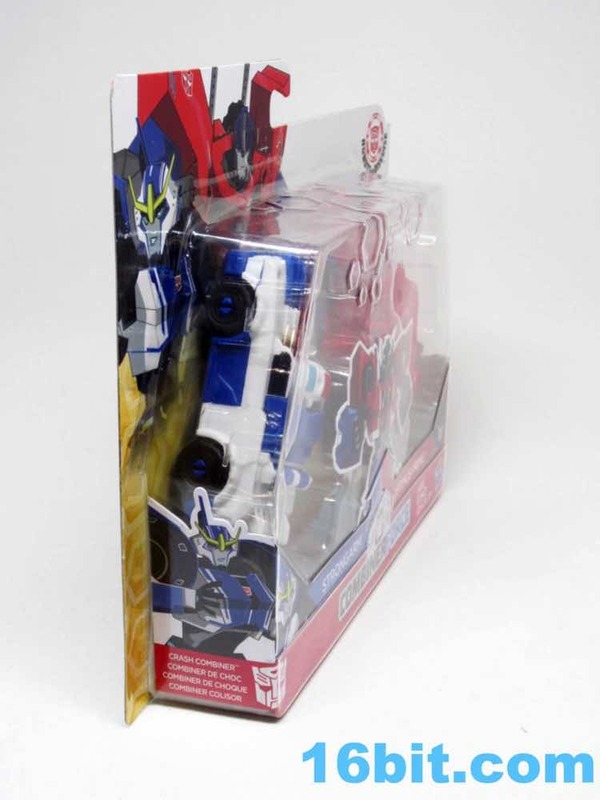 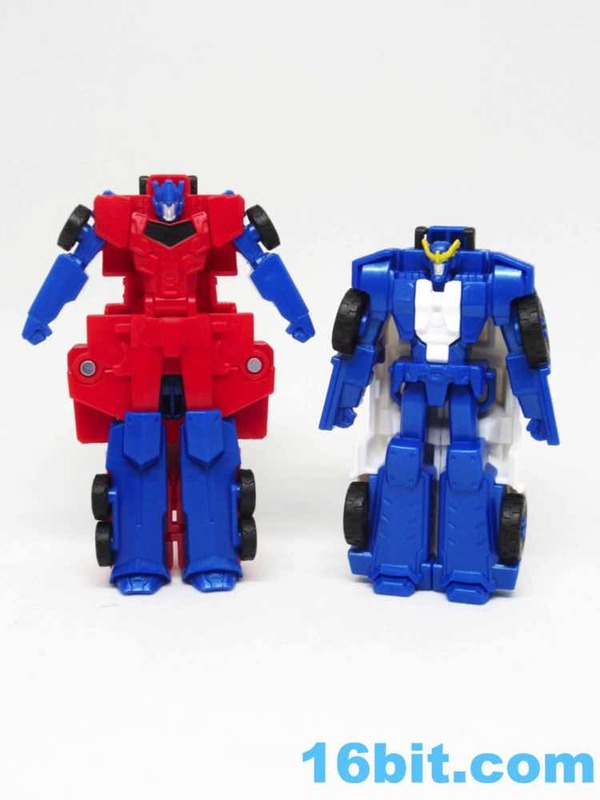 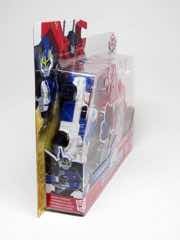 Of course, you also get two individual robots in disguise. Transformations are about as complicated as the SpeedStars or Roller from the Legends line - stand it up, flip out the head, and you're done. 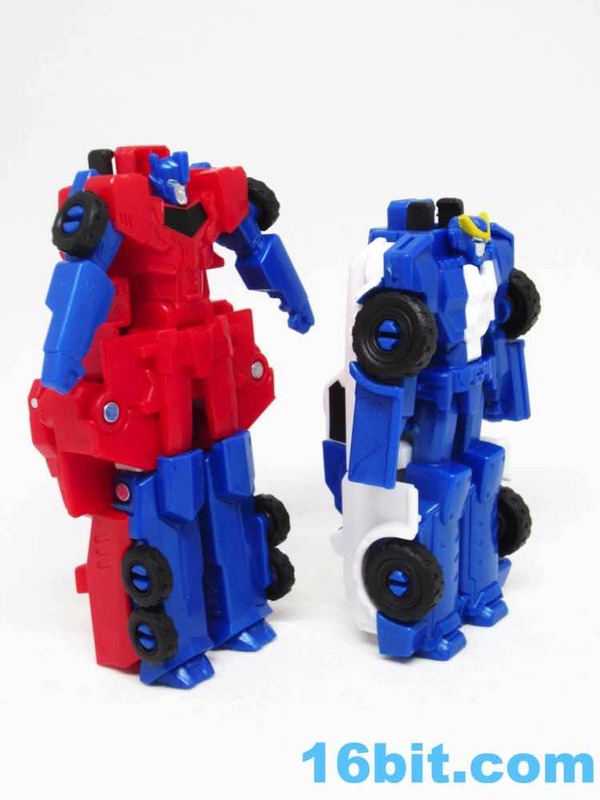 Optimus Prime is a little taller at a hair over 4-inches, while Strongarm is shorter at roughly 3-inches tall. The arms can swing out a tiny bit, but deco and articulation is incredibly low. They're about on par with fancy Happy Meal toys. 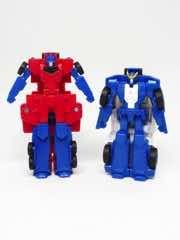 They look perfectly nice, but if you've already bought Legion or Warrior class toys, the robots as individuals aren't much to speak of. 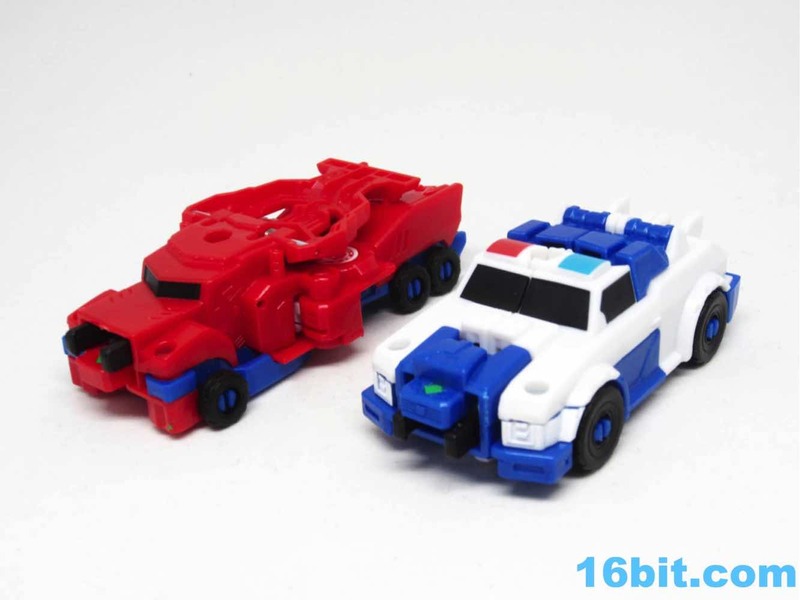 The same can be said of the vehicles - Strongarm's police car mode is good, a little beefier than a Hot Wheels car with limited deco. 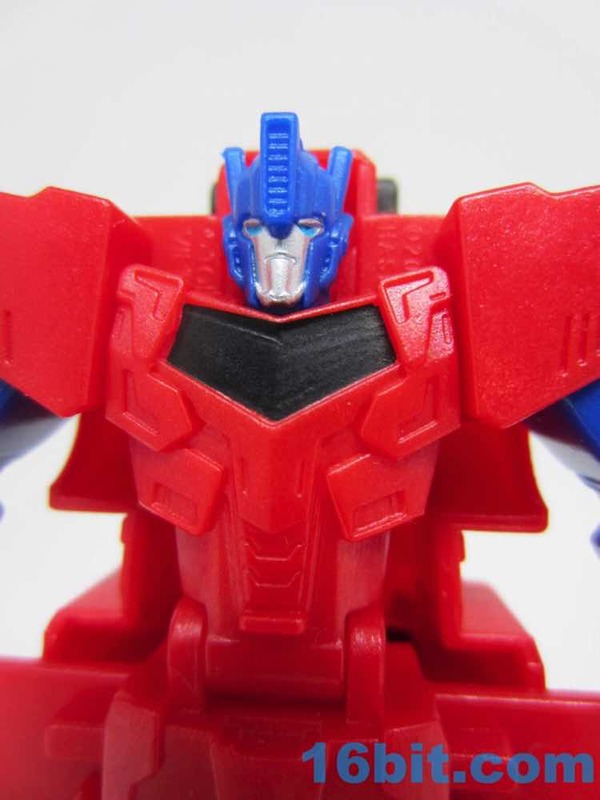 Optimus' truck mode is pretty hideous as it needs to serve as the chest armor for the combined robot, but the front of it looks similar to other Robots in Disguise Optimus Prime toys. There are hex ports on top of both modes, but no accessories are included to mount on top of either of them. If you have Mini-Cons or other 5mm accessories, you may wish to plug them in there or in the combined robot's fists. 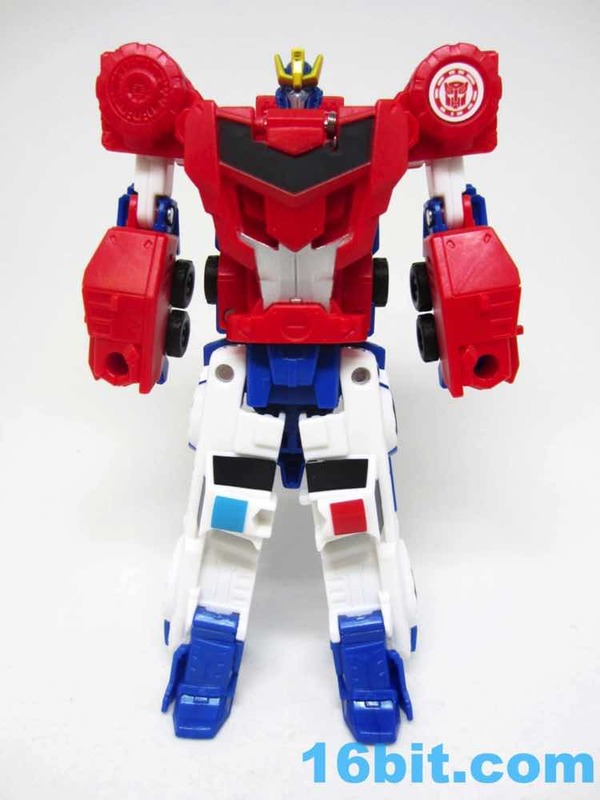 With an Autobot symbol visible only in combined mode, Primestrong is a bit of a departure from what we usually get here. The size class was clearly meant to compliment last year's armored Mini-Con and Autobot sets, but they're not going to appeal to as wide of an audience. 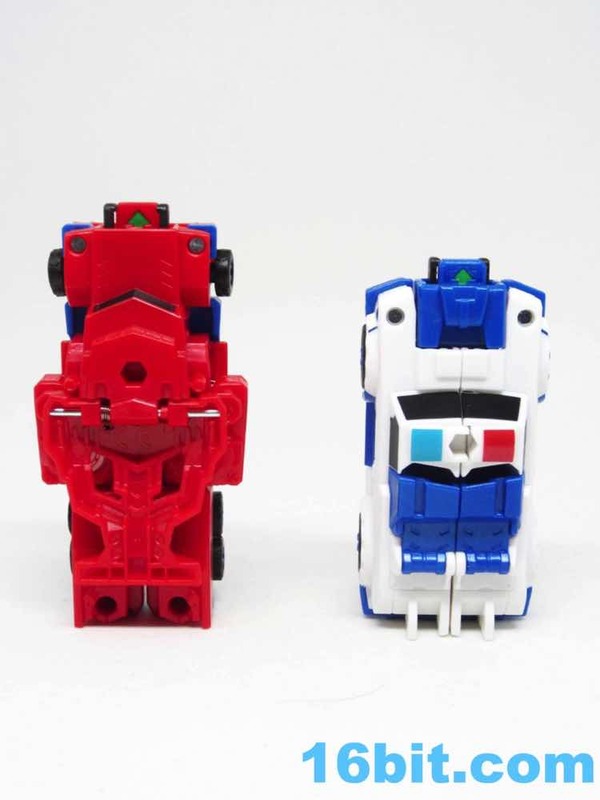 You'll buy one as a curiosity and probably will stop there. 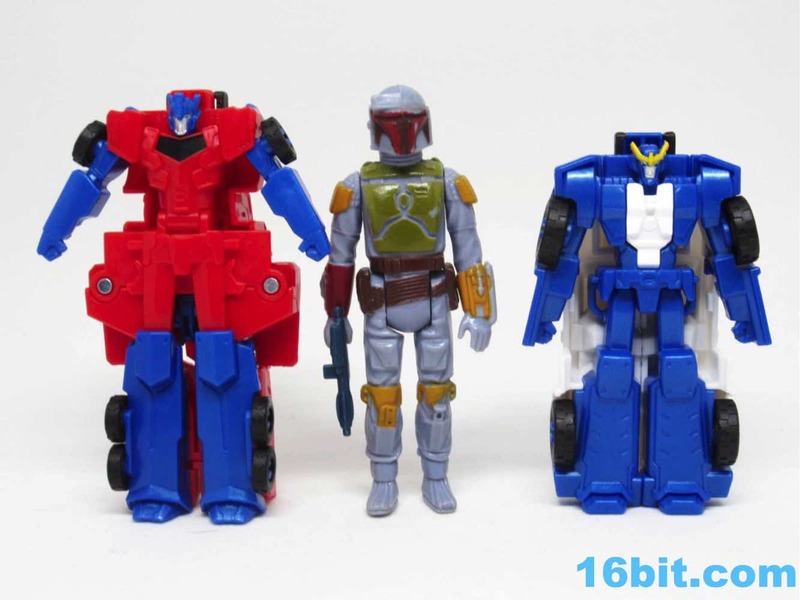 It's neat - and the combined modes are technically new characters - so it wouldn't kill you to play with a set if the chance comes up. 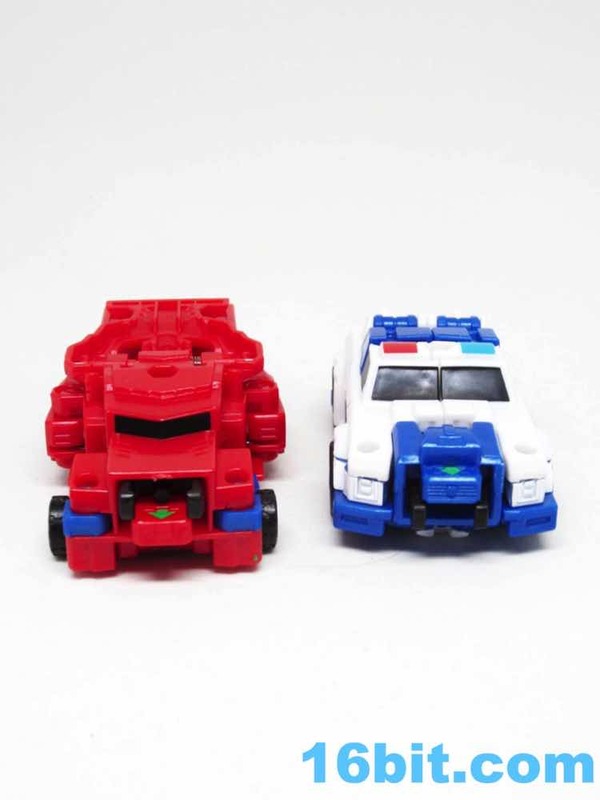 You might like them - but I almost wish they skipped the individual robot modes completely to favor the larger robot. 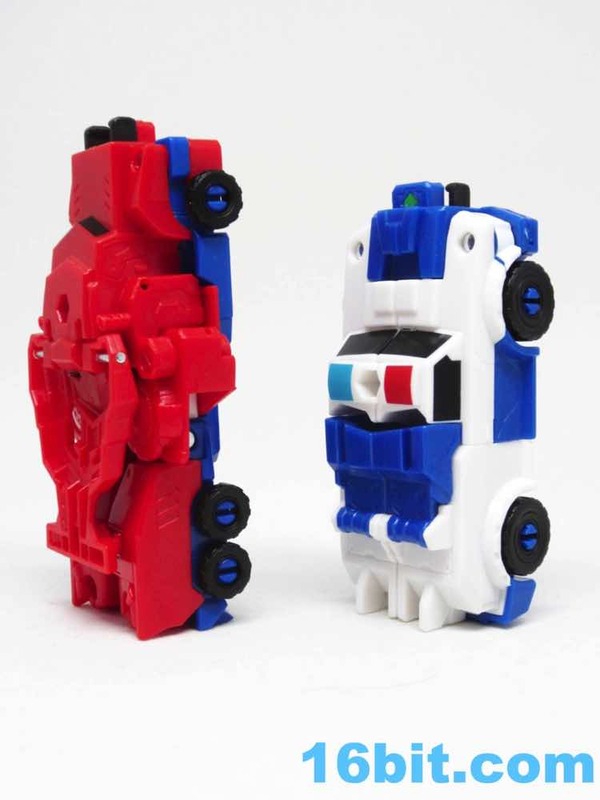 If you need a rating on this, I'd say it's a B+ concept with C execution. 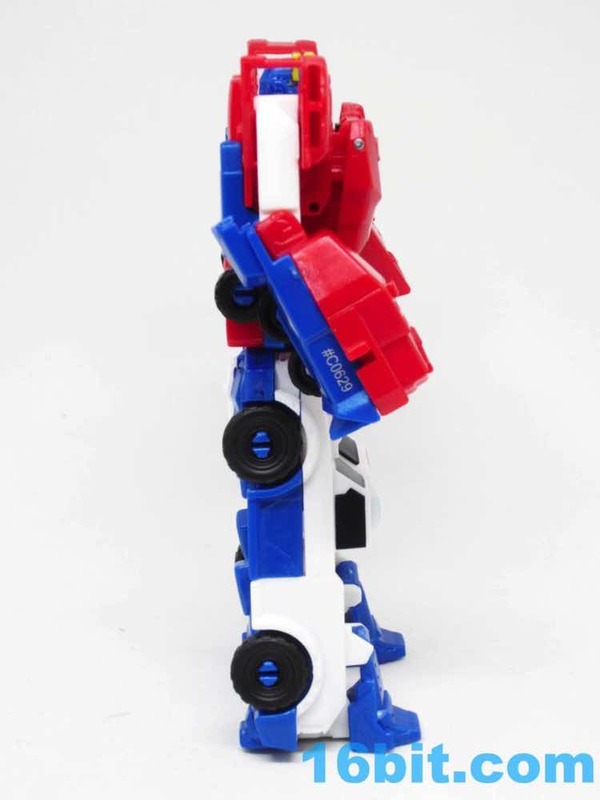 If it did a little more - or a little less - I think it'd be a better toy. It's at a price point that's too expensive to be cheap and too cheap to be good, so I assume you won't see a lot of these before Hasbro pulls the plug in what I assume will be another line refresh in a year.